It is with the greatest pleasure and honor that we will present the Women's Board Award 2016 to a woman who is a role model for future board members and leaders - of both genders. The award winner is both analytical and articulate in the board. She is always incredibly well prepared and proactive. She has the courage to say what she thinks, and also points to the sore points - in a constructive way. In other words, she has a 'no nonsense'- personality that is both likeable and respected. Especially, because she is a strong coach and a good communicator. This year's winner has a broad professional profile that matches the global world we are a part of. Based on her financial background and extensive experience in HR, strategy, IT and general management, she has continuously expanded her responsibilities and has insight into every aspect you have to deal with as chairman. The evaluates at the same time that she has the tools needed to navigate in a variety of professional contexts - both in types of business, legal forms of enterprises, industries and cultures. The winner of the Women's Board Award 2016, has an exciting career path, which in the board part certainly has not yet reached its peak. With her experience from CFO roles in A. P. Møller Maersk Group, and subsequently as a central part of the Executive Board of Coloplast, she is, in combination with her current role as CEO of the Lundbeck Foundation, her undisputed competence and - not least - her appealing character, extremely well suitable to occupy board seats on the highest level. Gisele Marchand received the prize The Board Award (for women and men) in Norway. Haavind’s CEO Gisele Marchand was given The Board Award. The leader of the jury, Diderik Schnitler, expects to see her as chair of a larger company within a short time. Marchand has been noticed in the boardroom a long time. She often takes the lead in strategic issues and has a good overview of the control side of the work of the board. Furthermore, she is a fearless person, open, reliable and good at involving all the colleagues. We believe that Marchand is very well suited to a demanding chair position of a larger company, says Leader of the jury Diderik Schnitler. Wednesday afternoon was the price - The Board Award - awarded by the consulting company Bene Agere. The price is closely related with the “Chair of the Year”-award, and both prices aims to highlight the value of excellent board work. A number of industrial tycoons have now designated Marchand to be the board member with the greatest potential to be the best chair. Through interviews with the jury and me uncovered Marchand a confidence and degree of judgment that impressed us. She placed particular emphasis on how to utilize the overall board expertise through active participation partly through committee work and in plenary sessions, says Schnitler. Marchand started in DNB and has had CEO positions in Batesgruppen, State Pension Fund, Eksportfinans, and is currently CEO of Haavind an attorney company. She is a board member in Gjensidige Forsikring, Norway Group, Eiendomsspar and Selvaag Bolig. Winner Women’s Board Award 2015 in Sweden Lilian Fossum Biner. 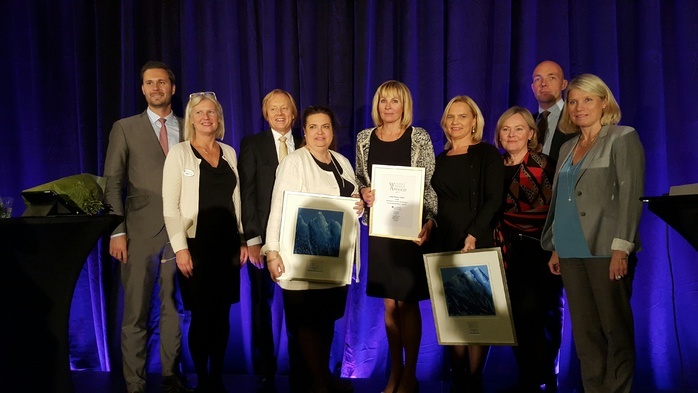 The Prize Women’s Board Award with the potential to become chairman of the large companies of SEK 700 mill in turnover goes to Lilian Fossum Biner, MBA, former CFO Axel Johnson, Senior VP HR and CFO Electrolux, Spendrups. "A strong leader with international credentials, as CFO as well as other business leading roles in several of our Swedish national jewels. More than fifteen years of board experience in Swedish and international large corporations and broad experience that covers several sectors, listed companies, state and family-owned companies and operational leadership roles in the majority of areas of operation. Her focus on leadership has made her a clear, responsive and valued manager and she will be a valuable support for the CEO in her role as Chair. " says jury leader Lena Möllerström Nording.